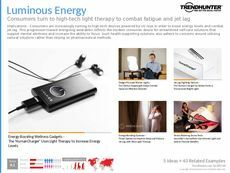 Find Better Ideas, Faster ® with a custom health wearable trend report, our PRO Dashboard and 80+ categories of premium trend reports. 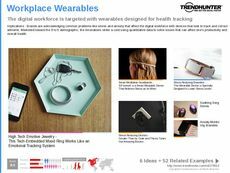 The Health Wearable Trend Report is an examination of the latest trends and products that are changing the current scope of the fitness, wellness and healthcare industries. This report will examine how products are being designed to combine fashion and health into one simple device. We will also explore apps, mobile devices, bracelets, and body-attached products that aim to increase one's health while simultaneously tracking progress. This report will be beneficial for those working in the healthcare industry, as it provides exposure to new products that can help patients and clients while they are at home. It can also be a valuable guide for tech developers to use in order to better understand the need for these wearable products. When reading the Health Wearable Trend Report, you will be preparing yourself to better cater to the needs of your consumers and create products that are desired.